Videos, examples, solutions, and lessons to help Grade 4 students learn to make a line plot to display a data set of measurements in fractions of a unit (1/2, 1/4, 1/8). Solve problems involving addition and subtraction of fractions by using information presented in line plots. For example, from a line plot find and interpret the difference in length between the longest and shortest specimens in an insect collection. I can create a line plot with fractions. I can use the information on the line plot to answer addition and subtraction problems. Judy conducted an experiment. She put a total of 2 1/8 cups of water into an empty container. Then Judy recorded the amount of water that evaporated from the container each day for four days. The table shows the amount of water that evaporated from the container on each of the four days. Show the data on a line plot. 1) How much water evaporated over the four days? 2) How much water does Judy have in her container? What mixed number represents the amount of water left in the container at the end of the fourth day? 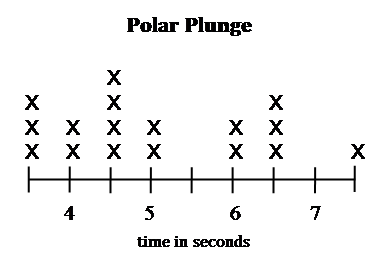 Last winter, Dylan and his boy scout troop participated in a special event called a “Polar Plunge” to raise money for charity. On a cold winter day, all the kids dressed in their bathing suits and jumped into the water of a local lake. The scouts earned money based on how long they could stay in the lake. The line plot shows the length of time the boys were able to remain in the water. Dylan was able to stay in the water 1 1/2 seconds longer than his friend Bryce. What are three possible times that Dylan and Bryce could have been in the lake? Jasmine volunteers at an animal shelter. One of her jobs is weighing the kittens and keeping track of their weights. 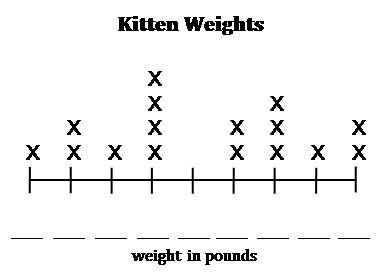 When Jasmine visited the shelter today, she weighed the kittens and made the line plot below to show the weights of the sixteen kittens. When Jasmine got home, she realized she forgot to write the numbers on the scale below the line plot. She remembered, though, that the smallest kitten weighed 3 pounds and that four of the kittens weighed 3 3/4pounds. Fill in the blanks to complete the scale of the line plot. Explain how you figured out what numbers to place on the scale of the line plot. Two of the kittens that Jasmine weighed, Butterscotch and Cocoa, are brothers, but they don’t weigh the same amount. Together, the two kittens weigh 9 pounds. What could the kittens’ weights be? Milkshake and Oreo are the heaviest kittens that Jasmine weighed Last week, Milkshake weighed 1 1/4 pounds less than he did today. What was Milkshake’s weight last week?